Complete Guide to Destination Weddings — and Why are They so Popular? Fiesta Americana Grand Coral Beach Cancun Resort. What's a destination wedding like? Picture yourselves in a warm, luxurious atmosphere with happy friends and family toasting the two of you after recuperating from travel time. Music plays and a feast of fine food awaits. A destination wedding can be as cool and casual as you like. Want to wear flip-flops or barefoot and dig your toes into the sand at a beach wedding? You got it! No heavy brocade wedding gowns or stultifying tuxedoes required, either. Make the ceremony as short as you like, then strip down to your bathing suits and swim away. Or head to a patio, start the music and champagne toasts for a party that can last until the stars com out. The short answer: Anywhere you want. The longer answer: If you want to get legally married outside of the country, you'll need to abide by that nation's wedding requirements and bring all necessary documents. A waiting period, even proof of inoculations, may be required. Do call an area's Tourist Office to learn the legal requirements for marrying in the destination. Some Caribbean islands require residency prior to the ceremony plus proof of citizenship, completing several documents, and a nominal fee. The way many couples circumvent this is by first marrying at their local town hall and then having a symbolic ceremony in the destination they select. Bermuda is a romantic place to wed, and several resorts offer turnkey wedding packages. While some couples choose to get married atop a glacier or in scuba gear under the sea, the most popular wedding destinations are beach resorts in the Caribbean and Mexico. Many are experienced in hosting destination weddings and can provide a turnkey affair, providing everything from the setting to the officiant and an altar, flowers and cake, music and photography services. Check their websites to see if they have a weddings section with set packages that can be customized. Couples on a budget can also marry inexpensively at an all-inclusive resort. Sandals offers free basic ceremonies to couples who book a stay for three nights or longer. Other all-inclusive companies, such as Iberostar in Mexico, offer wedding packages that start at $999. Cruises are another option for couples considering a wedding away from home. Ships already have the elements of a wedding in full supply—kitchens and gathering spaces, musicians and photographers, and even a captain who may be deputized to perform weddings on sea and/or land. There's something intimate and romantic about gathering your nearest and dearest to stay together at a multi-bedroom villa or vacation rentals. Some are quite luxurious and come equipped with a dedicated cook and maid as well as a private swimming pool. The drawback is that if you want to be married in one of these rentals, you'll have to bring in all the elements, from the officiant to the musicians yourself or hire a wedding planner to arrange for them. 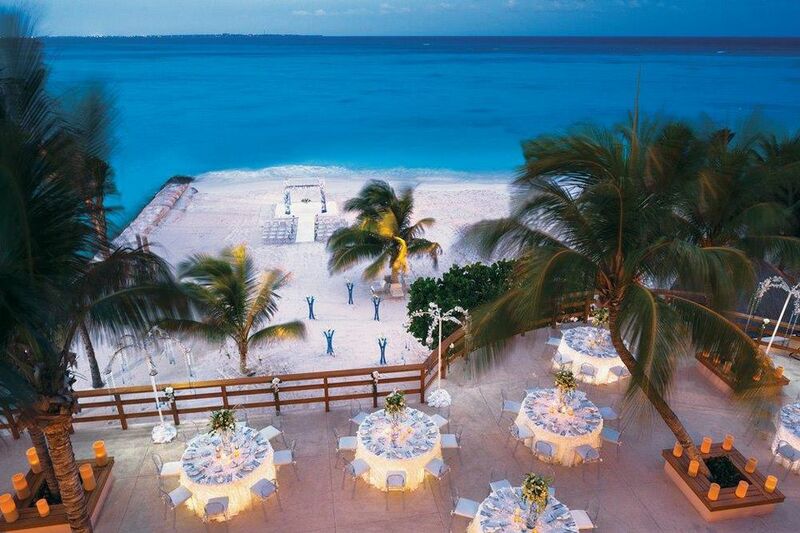 See the most popular places for destination weddings. Bridal consultant and author of Weddings for Dummies Marcy L. Blum notes a rise in the destination wedding, where a couple invites their nearest and dearest on a mini-vacation. The ceremony itself, the reception, and the honeymoon all occur over a long weekend, along with other destination wedding activities designed to bring the revelers together. "A four-day wedding weekend can cost less than a meal and reception for 150-200 people at a luxury hotel in New York," says Blum. "At a resort in Jamaica, for example, it might cost $40,000 to invite 20 couples to spend four days at a destination wedding. That includes a rehearsal dinner on the beach serving the island's traditional jerk barbecued foods and exotic tropical drinks while a reggae band plays -- as well as a formal sit-down wedding in an air-conditioned room or on an outdoor terrace and a farewell brunch." For one destination wedding, Blum sent invitees a questionnaire beforehand to determine each one's special interests in order to construct an itinerary. Over the course of three days there were opportunities for them to snorkel, SCUBA, participate in a tennis tournament, play beach volleyball, and take lessons in dancing to reggae music. Couples planning a destination wedding without the help of a consultant can work with a hotel's concierge, wedding planner, or banquet planner. Read through these key destination wedding questions to ask. The etiquette of a destination wedding generally calls for invited guests to pay for their own airfare and accommodations. The bride and groom pick up the tab for the ceremony, reception, guest food and beverages, and additional festivities. They may also want to prepare goody bags filled with a location map, SPF, flip-flops, a bottle of wine, and a welcome letter. Brides and grooms who have known forever that they will want to celebrate their wedding in their hometown, perhaps reciting vows in the same church or synagogue where their parents or even grandparents wed, will not want to travel out of town. Couples who don't enjoy travel shouldn't have a destination wedding, either. Nor should couples who look at their guest list and know that many people who matter to them would not be able to attend a faraway wedding because of finances, time constraints, family obligations, or for other reasons. But if a destination wedding sounds like the answer to your prayers, go for it!